Find hotel near Kecak Fire And Trance Dan .. This traditional dance performance of Bali is a combination of music and drama, performed ordinarily by men and some women by some exception. The main theme of the performance is based on the incidence of Hindu epic Ramayana. An original art of Balinese people, this art form gained a momentum with the help of Walter Spies- A German painter and musician who shaped the performance to interest the western audience. Today, it is a matter of pride for the Indonesian performers. 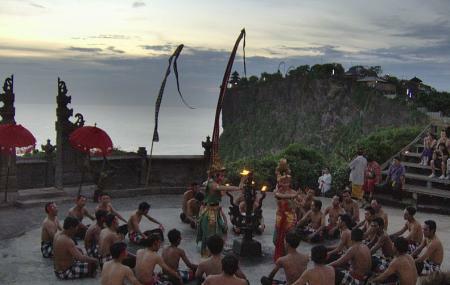 Use Bali trip planner to an idea about how to reach and plan a visit to Kecak Fire and Trance Dance. There are some other venues for this performance and the venue and other details can be obtained locally. Given ticket price is for the dance show. The village is open for 24 hours. Dance show takes place on Wednesday and Saturday: 7:30pm. How popular is Kecak Fire And Trance Dance? People normally club together Legong Of Mahabrata Epic and Agung Rai Museum Of Art while planning their visit to Kecak Fire And Trance Dance.